You are currently browsing the tag archive for the ‘estranged mothers’ tag. There is no magic wand or right way to help us through the tough times. But without could haves, shoulds or musts, each of us can tune into what we need on days that are harder than others. As Mother’s Day approaches, I offer all mothers apart, whether or not you have contact with your child, three ideas to support you to take care of yourself. In her book, ‘On Looking’, Alexandra Horowitz sets out to see the spectacle of the ordinary. I usually suggest getting out in nature for lifting low mood, but the concept of looking is wider than this. Looking is about reawakening the power and beauty of observation. The idea is that wherever you are, you observe your surroundings – the buildings you walk past, the cracks in the pavement, the flowers or weeds that grow according to their own cycles. There is no goal, we simply observe. Looking is a frame of mind. A real bonus to this, is that when we pay attention to our environment we disrupt repetitive thoughts, negative narratives and painful memories – a good strategy for taking care of a heavy heart on Mother’s Day. Looking at your surroundings takes you out of your head. It helps us to see more of how life is unfolding around us instead of being preoccupied. We notice the world instead of missing both the everyday wonder of things and the children we love. We need to cherish ourselves. No matter what someone else might have said about you or however hurt you feel by the behaviour of others, you are worthy of self acceptance and self care. It is possible to accept ourselves for who we are and allow ourselves to be as human as the next person with faults, strengths, weaknesses and virtues. We are the best thing we have got going for us, we are the greatest thing that will ever happen in our lives! How wonderful that we can decide how to live no matter what other people think, even if our worth is ignored and even if we are rejected. As Eleanor Roosefelt said, “No one can make you feel inferior without your consent.” Nurture yourself on Mother’s Day and on every other day – you don’t deserve a second class life. You have the right to make yourself happy. Take comfort from knowing that you are not the only one living apart from her child on Mothering Sunday. If it helps to be with those in a similar position, reach out to other mothers apart by joining the charity, MATCH. As a MATCH member you will be able to phone the new helpline and speak to other mothers apart. If it feels too much to share your circumstances, you might gain comfort from reading Rosie Jackson’s new memoir, ‘The Glass Mother’, her compassionate personal story of living apart from her son and ultimate reconciliation. Do whatever it takes to get through or better still, enjoy Mother’s Day. For some, this will mean hunkering down, having a duvet day and avoiding the hype on social media. Others will allow themselves be comforted and cherished by someone who loves and cares about them. For others still, being involved in a completely different activity, one that doesn’t involve flowers, chocolates and Sunday lunch will be just what they need. Djembe playing, canicross, aerial hoop exercise, fly fishing….do whatever it is that makes you feel good. You are allowed to have fun and enjoy yourself! However you spend your day, remember it will only last for twenty four hours. The sun will set and a new day, presenting new opportunities will dawn. For many people, 2016 has been a wearing and emotional year. War, migration, financial hardship, uncertain political outcomes that were too close to call, have created division. The ending of the year is an opportunity for everyone to pause, reflect and avoid conflict in the interests of peace. As mothers apart from children, we have our own challenges as we grapple with hurt, anger, provocation and strive for goodwill and peace of mind. As Albert Einstein suggests, we can’t force others to keep peace. But we can choose the path of peace ourselves. You might ask, why bother when others seem committed to conflict? Bother because you are worth it – your physical health, emotional wellbeing and your right to happiness are more than enough reasons. Stories on The Forgiveness Project website describe the power of choosing to forgive in order let go of resentment and find inner peace. In choosing this path, you also model dignified and compassionate behaviour for your children, whether or not you have contact with at the moment. How can we achieve peace? Einstein says it can only be achieved by understanding and I do believe that it’s true. Peace is easier to achieve through understanding, than through gritted teeth. What does understanding and the pursuit of peace mean for us when we live apart from our children at Christmastime? Avoid magical thinking. If you are estranged and without contact, don’t get taken in by warm, glowing images of family gatherings in adverts and nostalgic Christmas songs. These sensory stimulations can fuel magical thinking that estrangement can just melt away and all can be made better just because it is Christmas. The cause and impact of rifts need to be understood and reconciliation requires both parties to be willing and able. If your children are young, perhaps they are not emotionally or mentally developed enough and maybe your ex partner is not supportive of this. If your children are young or fully grown adults, perhaps their life stage or circumstances mean they are just not ready yet. Whatever your circumstances, both parties being ready means that you don’t plead, beg, insist or demand, that it is not just you doing all the work. Keep it simple. If you have contact with your children remember that no amount of hype, spending or activities will make up for the past. Expensive gifts won’t buy you the love of your child. Providing nonstop entertainment won’t make you (or your new partner) more easily ‘forgiven’ or accepted. Rebuilding and maintaining relationships after family breakup takes time and understanding. One special day of the year won’t cut it when what you’re dealing with is the incremental work of a lifetime. There is no magic to be made or found on Christmas day, so relax. Breath. Be fully present in the moment with your child. You are enough. Shake it off. Whatever your circumstances, allow yourself the right to happiness. Build in time for peace and reflection. Turn off the TV and device and be still awhile. Get outdoors, there’s nothing like a walk to lift your mood. Chat to others in the supermarket queue. And when it all gets too much for you, let it go. As Taylor Swift sings in Shake it off – ‘the players gonna play, the haters gonna hate, heartbreakers gonna break, the fakers gonna fake. I’m just gonna shake, shake, shake, shake, shake. That’s my mantra this Christmas! A peaceful 2016 to you. Can you let go of Mother’s Day? I’m right with bestselling author, Michael Singer when it comes to letting go. When I discuss letting go with my clients, it’s not unusual for them to cry, “That’s impossible, I hurt too much” or “I love my child too much” or “Why should I let him/them get away with it” or quite simply, “I just don’t think letting go is possible”. I needn’t tell you how hard the lead up to Mother’s Day is when you live apart from your child. It edges its way into our lives – from gift shops to bakeries, we are reminded not to forgot it. You can’t stop others promoting Mothering Sunday and you can’t control whether or how your child will validate you on the day. What you do have power over though, is how you respond. So what is Michael Singer getting at when he says, “The bigger it is, the higher the reward of letting go and the worse the fall if you don’t”? What does he mean by reward? To my mind, living apart from a child is up there with the big losses. The pain of reduced contact, estrangement and rejection can feel overwhelming. Rejection on Mother’s Day can feel unbearably painful, if we allow our feelings to create thoughts about it. We do this in many ways like reliving the unfairness of it in our heads, or telling ourselves we are bad mothers and don’t deserve it, or imagining what our children feel by projecting our feelings on to them, to name a few. We hold on tightly to our perceptions, increasing our distress and creating Singer’s ‘the worse the fall’ scenario. To hold on to the pain stops us from living in peace and happiness – these states of mind are the ‘reward of letting go’. The good news is that you are capable of giving yourself this reward. Watch your feelings. You can’t stop your feelings, they will come and go and you do need them! Regard them like clouds moving across the sky, sometimes light and fluffy, sometimes dark and heavy. Observe them. Watch how easy it is, if you allow it, for your feelings to inform your thoughts to create a story, sometimes a very detailed narrative, which keeps you reliving, picking at yourself, doing anything but letting go. There is another way. Breathe. Feel your feelings, let them move through you. 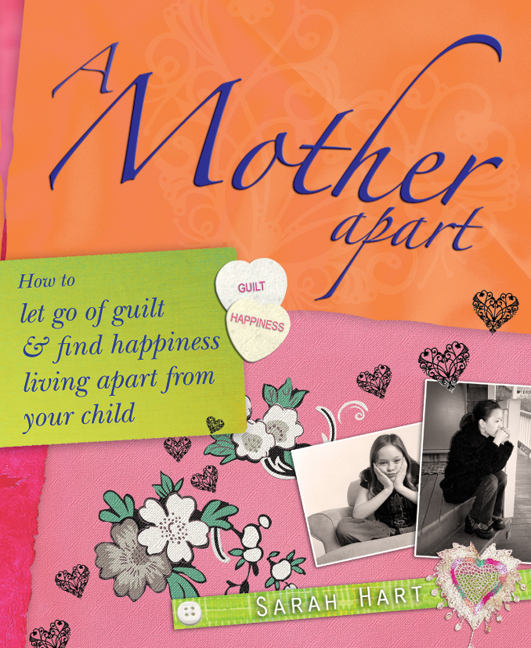 In my book, A Mother Apart, I write about allowing your heart to be broken rather than ignoring, fighting or feeding the pain. Don’t resist and get hooked into the story. Feel your feelings and know they will pass. Feelings are what we experience as human beings – but we are not our feelings. When do you let go? When you notice strong negative feelings, for example, the type you would associate with not being acknowledged on Mother’s Day. Tune into your body. Is your heart beating hard, do you have pain or knot in your stomach, do you feel you want to run away, fight or collapse internally? These are ways that our bodies experience stress and emotional pain. This is your cue to let go. When you start to feel urgent, like you have to take action right now, let go. Generally, the more you feel you can’t let go, the more you will benefit if you do. As a mother apart from a child, if ever there was a day when it was important for you to let go, it is on Mother’s Day. Holding on to suffering does not turn back the clock or change anyone else’s behaviour towards you, that is their business. As Michael Singer writes, “It’s pretty black and white. You either let go or you don’t. There really isn’t anything in between.” Practice letting go this Mother’s Day and every day. You don’t deserve to suffer. I love this quote from Alice Walker who understands the pain of being a mother apart – the last time I heard she was still estranged from her daughter. What does it mean to have power in any given situation? Perhaps we feel this when we agree a parenting plan with our ex, or reach an acceptable financial settlement or achieve the status of resident parent. These often hard won examples quite rightly help us to feel empowered, validated and vindicated. But how do we feel when things don’t work out the way we would like them, when life doesn’t feel fair or right? How easy it can be to feel disempowered, unequal and less than. There are two different ways to feel powerless. The first is caused by someone or something external such as, our ex having residency of our children, our child decides he or she wants to live with their father, we are obliged to pay maintenance to our ex even though contact with our children is being obstructed. The second way we can feel lacking in power lives internally within ourselves. Some of us have an accumulated sense of helplessness from abuse or neglect during childhood. Others build up a sense of helplessness in the more recent past – having endured an abusive marriage is an example, the way we have felt undermined, bullied, undefended. Sometimes years later, we can still feel vulnerable, judged, criticised or guilt ridden. Even though we no longer have anyone in our lives putting us down we find that we are very good at convincing ourselves that we are powerless. In my work with mothers apart from children I often see both external and internal powerlessness. Women who have lost so much – children, homes livelihoods – self belief, self worth and the ability to self care. How can we empower ourselves? Stop railing against the things you can’t control. You can’t re-write a Cafcass report, or force the legal process. You can’t make a rejecting older or adult child value being with you or insist someone else changes their opinion of you. But you can change yourself – your point of view, your attitude, your actions, how you treat yourself – and feel a lot better for letting go of trying to control people or things. And sometimes when we change, others change too. Take responsibility for your thoughts. It’s your choice to adopt criticism from others as your perception of who you are. Allowing judgements and criticism from others to rule your thoughts will impact negatively on your behaviour. Don’t give others this power over you. Remember Eleanor Roosevelt’s wise words – “Nobody can make you feel inferior without your permission”. Watch negative self talk. I hear mothers apart from children say the most cruel and undermining things about themselves – “I was/am so stupid, gullible, weak willed, it’s all my fault, I can’t forgive myself” – the list is long and the self punishment powerful. Pay attention to any self-defeating thoughts you have. Talk to yourself like you would to your best friend, not to someone you don’t like. You deserve to be spoken to with compassion and loving kindness, give that to yourself. Observe your mindset if you slip into thinking ‘I will never get over this, things will never change, it’s not fair, not natural, not right, not possible’. Stop! Really? Can you be sure? Bring yourself back to the present when your view on the world becomes dark, small and limited. Who is to say this thing that feels insurmountable isn’t the very thing that needs to happen. We do not possess insight into future, neither can we control it. What a wonderful word! The Oxford dictionary defines potency as ‘The power of something to affect the mind or body’. Close your eyes and breathe in a sense of potency into your belly. Bolster yourself with these thoughts: Some things take a while, maybe months, maybe years. I will bide my time. I will shape up a good life for myself. I will be happy. To help you along your way you might enjoy the poem Phenomenal Woman by Maya Angelou . Go on, read it out loud for all of us! Well-being for mothers apart from children: what will you be doing on Mother’s Day? Although we know it happens every year, seeing Mother’s Day cards and gifts for sale in the shops can kick start what is called a frequency illusion, also known as the Baader-Meinhof phenomenon. This phenomenon happens when you notice something and then start seeing it everywhere. When we have strong feelings about something, the frequency illusion is bound to be heightened. For example, mothers living apart from their children might notice the date on which Mother’s Day falls, which can then lead to observing local florists and restaurants advertising the event with painful regularity. Frequency illusion is a passive experience, in other words, our brain seeks out information that resonates with us, making us believe that there is an actual increase in the frequency of these occurrences. This being so, perhaps a more conscious, rational approach to Mothers Day will be helpful. Are other people doing something? So who is doing what on Mother’s Day? I’ve just searched the internet with the following ‘Mothers Day 2015’ and found there are over 35,100,000 results. If we’re not consciously aware of our own wellbeing, we could be blindsided by a bad case of FOMO at this time of year. In case you’ve not heard of FOMO before, new technology, particularly social media has coined this phrase. ‘FOMO’ stands for ‘Fear Of Missing Out’. If you let them, happy family photos and messages on social media could leave you feeling hurt – you don’t even have to physically walk past Mother’s Day cards, flowers, chocolates, pink bubbly in the supermarket to feel excluded or envious. We can’t control whether or not our children will acknowledge us on Mother’s Day but we can take care of ourselves. Could the day be an opportunity for you to relax, create, take some exercise, book a trip, find a class, read a book? Whatever it is, do what feels right for you, never mind what others are doing or what they think. Whether you’ve planned something pleasurable or spend the day doing something you’ve been meaning to crack on with, just do it – no matter how you feel. Instead of taking your lead from blue feelings and then giving up, practice watching your emotions come and go without trying to change them or push them away. This is what Buddhists call non-attachment. It doesn’t mean being like a stone. Watching rather than buying into our feelings becomes possible when we understanding them as passing and temporary. Upset comes upon us and it leaves and it can help if we don’t judge ourselves. In other words, we don’t regard our feelings or ourselves as either negative or positive. Try allowing feelings to rise, soften and fall away, rather than feeding and fuelling the drama of what we tell ourselves about our circumstances. So, even if you’re feeling unmotivated or resistance towards Mothering Sunday, allow the feeling and at the same time, start doing whatever it is you have decided to do on the day. Even though it’s not the aim, you might surprise yourself and find that you have a good time. What thing are you not going to do? Hot on the heels of doing something just for you on Mother’s Day, how about reconsidering what you currently do routinely? Maybe there are things in your life that you no longer have the time or energy for, such as a club or a class and you just don’t want to let others down by moving on. Perhaps it’s a belief or a behaviour that has had its day and you fear you’d risk losing part of your identity if you gave up on it. This might be the expectation of meaningful contact with your child at this point in time. It might also be the notion of taking off the hair shirt that we can inadvertently pull on when we live apart from children – ‘I should have done more or less, earlier or later, held my tongue or have spoken my mind or fill in the blank……’ – leg traps all! If this resonates with you, there is no need to do this to yourself. It serves no one, least of all you. Make it top of your ‘no longer going to do’ list. Whether you have contact or not with your children, whether they appreciate your love at this time or not, do whatever you need to do to take care of yourself this Mother’s Day. Do the thing you think you cannot do, especially if this thing is treating yourself with gentleness and compassion. Despite the knowledge that from a religious perspective Christmas is the time of good cheer and celebration, this time of year can highlight the flaws in our lives. A lack of money when people are buying presents, illness or depression when others are partying or being alone in what feels like a world full of happy families. How can we best support ourselves over the festive weeks? I hope the following scenarios help to shine a guiding light on finding peace of mind. A mother apart had made good progress after feeling that her world had ended when her teenage son decided to live with his father. She was beginning to shine once again, discovering fulfilment as an independent woman as well as making time to be with her son, although he did not always want this. A few weeks before Christmas he asked her to go late night shopping with him. Swept up in a seasonal fantasy – an image of the two of them enjoying gingerbread cappuccinos and watching carol singers in the square – she cancelled what she had planned for the evening. Instead of her daydream, the reality was one hour with moody lad who demanded to be taken home once she had bought him the latest computer game. She drove home feeling cheated and manipulated. It is wise to reality check the gold shimmering before us. Is it ‘realism solid’ or ‘fantasy plate’? The teenage years are a time of self focus, when thinking about a parent’s needs is unlikely. Remembering that this disappointing shopping trip is just as likely to happen when parents aren’t separated, can normalise and remove the sting. By ignoring the glitter – the longing for what we don’t have at this moment – and offering quality time that does not compromise us moving forward with our lives, we are best placed to enjoy a mutually rewarding relationship with our children if and when they are ready. A mother who was estranged from her two daughters, regularly sent them cheques inside of Christmas cards. Each year she waited with baited breath. If the cheques were banked quickly, she wondered whether it was a sign of change, perhaps a growing acceptance…or did the girls simply want the money? Every passing day without seeing a bank withdrawal filled her with anxiety and pain. Had they thrown the cheques away to demonstrate their rejection of her? As the years passed she sent larger sums of money which she couldn’t afford, hoping to see a quick deposit, perhaps even a note of thanks or phone call. She felt controlled even though sending cheques was routine created by herself. When we become aware of the ways in which we give away our power, we are able to begin new, healthy rhythms to our lives. We take responsibility for our decisions, unswayed by guilt. For example, “I chose to send this amount and no more to show I care. Whether or not they choose to receive my gift is their choice”. We strive to find a good balance between taking care of own needs and offering to meet the needs of our estranged children, if and when they are open to accept this. We march with confidence to our own drum. A time of giving or giving up? A mother apart struggled to hold on to her seasonal traditions after her divorce. Quite understandably, she longed for her usual family Christmas, familiar decorations, food, music and games. One year her ex partner insisted the children spend the day with him. Another year her children told her they wanted to be with their dad. As Christmas was so important to her, she suffered weeks of anxiety while it was decided with whom the children will be. On years when they were with their father, she felt a lingering rejection and resentment. The concept of giving takes on new meaning when routines of the past fall away. When we decide to let go of the past, we allow for new traditions to take shape, new possibilities that could be just as good or better. Giving up our desire to have things be a certain way can be done with a little goodwill on our part. If this feels impossible, then decide to let go for your own health and wellbeing. Emotional giving need not be giving up, if we make it our choice. To choose is to empower ourselves. Lonely or alone? A mother who is regularly apart from her children laughed when she told me how her lively, loud, extended family pre-separation Christmases used to be. She thought she’d never adjust but now she loves being on her own, viewing Christmas as a day for being incredibly self-indulgent in an unselfish way. She feels she doesn’t have to make anyone else happy. With only herself to consider, she eats what and when she wants, reads for hours, goes for a walk. One year, she focused on de-cluttering and getting organised for the year ahead. She said Christmas alone is always a day well spent. There’s not much I can add to this fabulous example of excellent self-care and making yourself happy! The 25th December is not a non-negotiable being together day. If you are going to be alone when you don’t want to be, make sure you choose how to spend your day. Even consciously choosing to do very little is healthier than feeling that very little happens for you. Where ever you are, whatever you will be doing, I wish you comfort and peace this Christmas. Would you consider giving up hope of a happy Mother’s Day? As a mother living apart from your child, how do you approach Mother’s Day? Some of us set out to ignore it as much as is possible and why not – it could be argued that viewing Mother’s day negatively will save you from feeling at best disappointed and worst, rejected. Others choose to make a day of it even if they are not acknowledged by their children. To adopt a positive attitude and enter into the spirit of Mother’s Day by pampering yourself or buying flowers could protect you from feeling pain or punished on the day. If either of these approaches work for you, stick with it! But if not, why not consider giving up trying to focus on either the negative or positive and give up the hope of Mother’s Day being either this way or that? Giving up hope might not be as hopeless as it sounds. When you have done all that you can to maintain contact with your children to no avail, or you have tried to encourage your child to live with you or meet up with you more often – being willing to be with what is, the reality of life this very moment – can be a huge relief. Being with what is means to stop trying to reach a place where we are immune to the pain of estrangement or being hurt by our ex. To look for permanent security and happiness in our relationships can’t help us either, as just when we reach a point of comfort, someone or something shakes life up again. It’s true too of blame. It might be that someone in our lives is behaving badly but while we keep the fire stoked under the pot of blame, we keep ourselves invested in it. Every time we try to push our pain away by blaming others who won’t accept responsibility or the part they have to play, we keep ourselves stuck. Trying to hold on to lasting pleasure or happiness can be a useful teacher – we learn it cannot be done. Sooner or later someone says or does something to upset us – maybe we won’t get the Mother’s day card we hope for, or one might arrive without loving words, or a card with the right words might come but without flowers, or flowers and chocolates arrive but our children don’t want to spend the day with us. Can we accept that at that moment, we feel pain and disappointment and if we allow it, those feelings will pass – just as feelings of happiness, joy and pleasure will come and go? I hope that this Mother’s day you will join with me in being with yourself just as you are, no matter what is happening in your life. If we give up the hope of Mother’s Day being as we would like it – we will have a chance of being joyfully with ourselves, present in our lives on the day. I believe you are worth this, I hope you agree with me.